Annihilation marks the artist’s first solo exhibition in Los Angeles, weaving a poetic tale of the city through the lens of his recognizable artistic lexicon. This new body of work reflects on the current model of globalized development and the forces shaping and affecting local identities around the world. Created from a variety of source materials including: carved wooden doors, acid-etched metal plates, styrofoam dioramas, hand-carved billboards, and newly developed concrete sculptures, the work presented in Annihilation engages with the urban context. With a particular emphasis on the impact of the Los Angeles way of life. Annihilation will share the stories of urbanites who breathe vitality into the densely populated urban epicenter, resonating and reverberating with the human experience of living in a contemporary megalopolis. 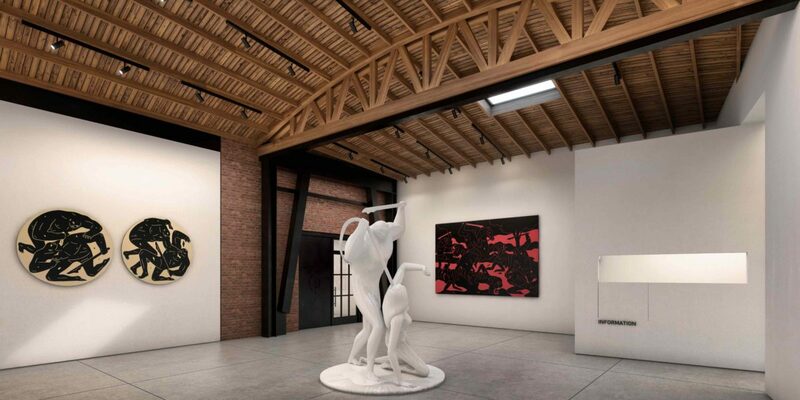 Following the success of the gallery’s initial three years in Hong Kong, OTI is excited to launch a new exhibition space in Los Angeles’ Arts District, a neighborhood with a growing number of contemporary art galleries and institutions. Designed by Los Angeles architecture studio AUX Architecture, the 6,000 square-foot building is an adaptive re-use of a 1930s bowstring truss warehouse. The inaugural program of OTI Los Angeles presents a strong selection of local and international artists including Ron Arad, Nobuyoshi Araki, Alexandre Farto AKA Vhils, Invader, Kathryn MacNaughton, and Cleon Peterson, along with a curated series of group exhibitions. OTI’s experimental program introduces a roster of artists focusing on global contemporary culture.